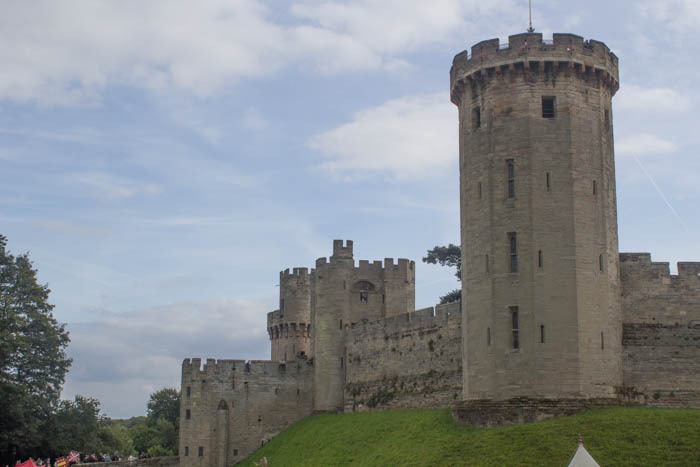 In today’s post I will look at Warwick Castle as a tourist destination, a place where history is recreated, and also provide a practical example of the Golden or Magic Hours that photographers prize. Beware, you have to endure me talking about my relationship with this place. So proceed with caution. 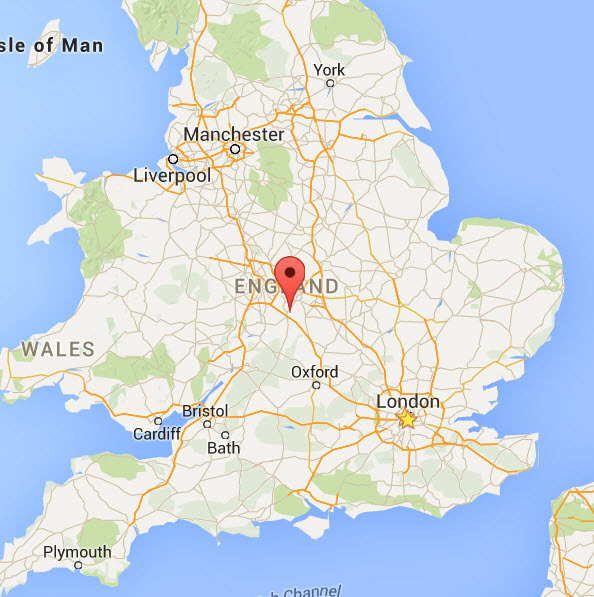 Warwick is a town towards the centre of England, and therefore is fairly easy to reach. 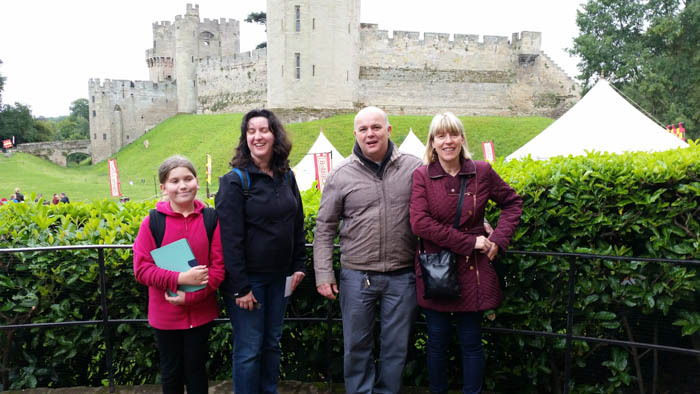 The castle itself is well signposted and has a huge parking area. While the place does claim Neolithic habitation, it was not until the sixth century that continuous habitation started. As for fortifications, these had to wait a few hundred years further until Ethelfleda Lady of the Mercians, and daughter of Alfred the Great decided that the place needed some in order to hold back the Danes. 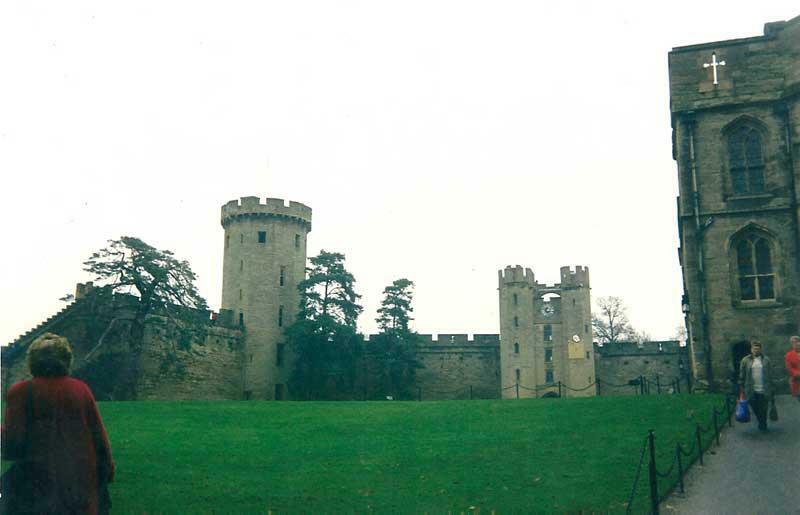 The castle as you now see it was started by William the Conqueror and its ownership has included names such as Richard III and Warwick the Kingmaker. Much of it was rebuilt in the 1500s and again in the 1600s. I took a good photo of Rhiannon aiming a 17th century hand cannon illustrative of the castle’s defences during the English Civil War. 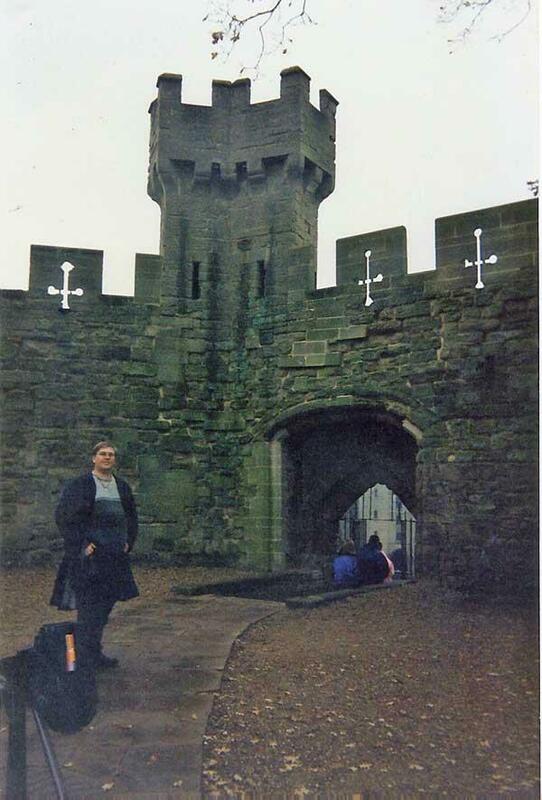 My personal history with the castle dates back to 1974. 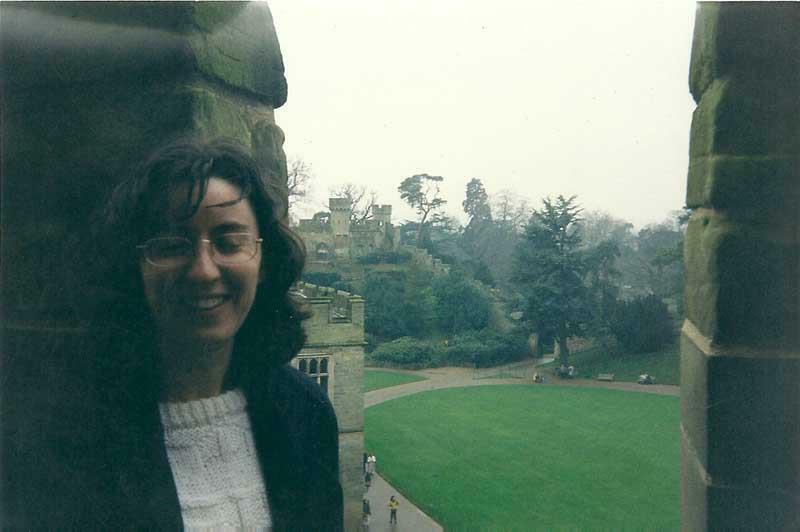 During a failed reconciliation of my parents’ marriage, we revisited Britain and the castle was one of the places we visited. Unfortunately I don’t have photos from back then but I do remember a grand if sombre place. Besides a few plaques the place really did not go out of it’s way to tell its story. This said, we were able to purchase a nice glossy booklet on the place. 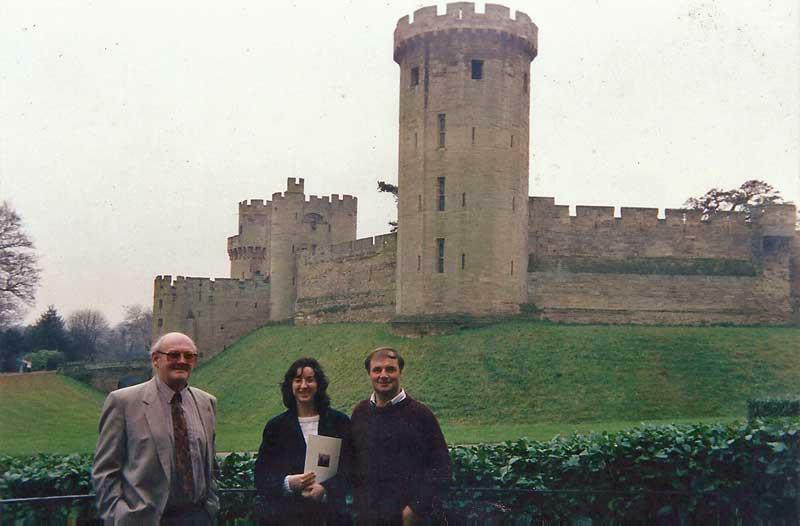 That’s my late father on the left, Nicole in the middle and my step-uncle Kevin on the right. 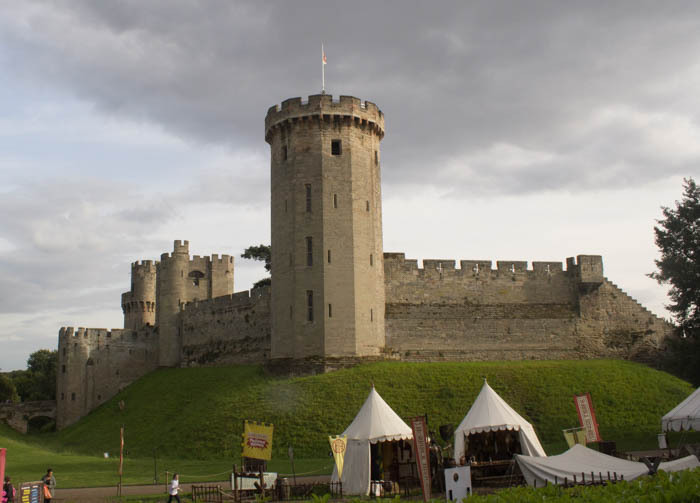 Hence I really did not expect the Warwick Castle of 2015. It was so much more commercial (and in my opinion better). OK – I’m interrupting my own fascinating narrative here to discuss the Golden Hours. Why? Well, notice my first photo with Dad, Nicole and Kevin. Here’s a shot I took just before noon this time (note: I have deliberately done no post-production colour correction in these pics – so you can see the original colours as well as my poor photography skills). There’s Rhiannon, Nicole, my step-brother Scott and his wife Gail. Notice just how much better the last photo looks. The tones and definition are just magical. I believe that this is not just something for photographs, but that digital artists creating 3D images should also consider emulating this in their compositions. Anyway, simply from these photos you should be able to see the differences. Note the tents now in the foreground. This is an entire tiny “encampment” where visitors can learn about life in medieval times. Some actors wander around here being fun and informative. 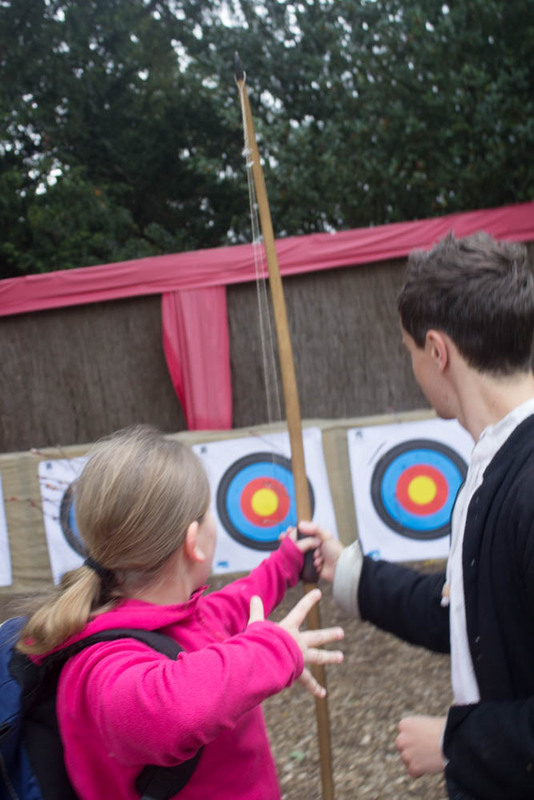 A little way up there was also an area where children were taught archery and sword fighting (for a price). My daughter Rhiannon loved it. So into the castle itself! The castle was grand inside. Alas some shots that I thought good ended up blurred due to the fact that I was still learning to take photos in dim light. One highlight was an audio-visual show giving the history of the castle. The audience were shuffled by cues from room to room with each stage. I particularly liked how they used the Harry Potter idea of “living” paintings to tell much of the tale. Each of the towers could also be climbed (as Rhiannon insisted). So you had better be fit because there are well over 500 steps in some cases. I also enjoyed the many manikins dressed in period clothes and set into appropriate scenes. Two other things to be aware of. They have a great raptor show to watch. And also Horrible Histories sometimes perform here. We caught both and really enjoyed them. This is definitely a place to take the family for a day out. Lots of activities and lots to see. Also, tomorrow I might make a simple 3D scene in either Bryce or DAZ Studio to see how easy it is to emulate the Golden Hours in such modelling applications. Awesome – sounds like you had a lot of fun! From the built-in solutions, Iray’s sunsky seems to be capable. I don’t remember if there are any working settings for shadow softness, though – some “haze”/”turbidity” parameters, or suchlike. And I guess that the tonemapper camera settings should be adjusted a bit for sunset/sunrise – I personally found even the “noon” light to need a bit more ISO than the default DS Iray settings provide. As for Bryce, I remember I tried to do a render with “volumetric world” option enabled once – it was years ago, so it took a good number of hours, but the result was interesting. This might be a perfect complement to the “golden hours” scene, especially with clouds or trees to go for the “godray” effect. And “true ambience”, it’s one parameter that has long mystified me – as far as I understand, it is a sort of GI. But I never managed to come up with any meaningful Bryce scene to test it on – given that I was not built to navigate the “Kai Krause”-style artistic interfaces, I simply lose patience way too fast. Have you ever tried the “true ambience” thing? 1. the colour of the light (a soft golden). 2. the direction of the light with its impact upon shadows (keeping the light source just barely above the horizon cause the shadows to be longer and/or more pronounced). By simply doing these things I reckon we can make a difference.